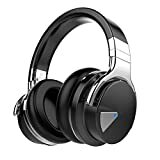 We covered a killer sale last week on the COWIN E7 Active Wireless Noise Cancelling Headphones, and it was one of the most popular products we covered all week. They retail for $73 and they’re already a bargain at that price. But an Amazon sale slashed the black color option to just $59.99, and then a $10 coupon on the product page sealed the deal at $49.99. Well, we have some fantastic news if you missed that sale: It’s not too late to get a pair at that price!